This might be my tipping point. It's another snowstorm whose trajectory the weather people got wrong. 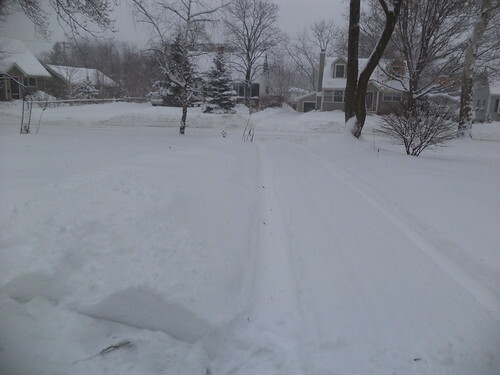 I had just widened the front walk from the one on Thursday. They were saying, as late as 4 p.m. last night, that my area would see no more than 4 inches of additional snow. What do you think? It was lovely yesterday with temperatures hovering around 30. That's why I went out to widen things out. 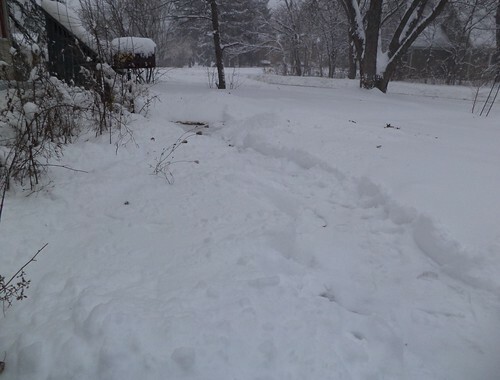 Shoveling, the hour's worth I put in, was a breeze. I figured I could get out this morning, as long as I went early, and 4 inches wasn't going to put a damper on travel. 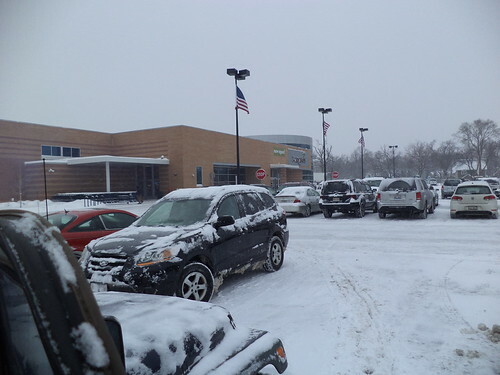 The drive to the grocery was slow, but the lot was cleared. Carts were being rounded up as quickly as inconsiderate people just left them instead of putting them in one of the cart corrals. There weren't many people in the store at 9:30, which was good for me since I had to go slower than usual owing to forgetting the list on the kitchen table. I remembered everything except the chicken bouillon cubes and the cat treats. Then, I had to head to the pharmacy. There had been a phone call about a prescription refill but I wasn't sure, looking over my medications, exactly what was being refilled. Since I have everything on auto refill, it was probably something important. The drive east was not fun. 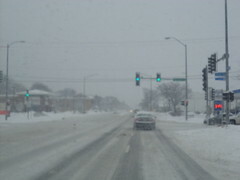 The roads were mostly plowed but not clear, as you can see. And under that snow was, in places, a thin sheet of ice. I kept my distance from the car in front of me. I'm in four wheel drive but that does not guarantee complete instant stopping if there is ice. From the pharmacy, I headed to the office to get paperwork to work on at home tomorrow, should the boss call us off. As I neared the building, the car in front of me, same distance as in the photo, slammed on the brakes and went sideways into the snow heaped on the roadside. I was able to pump the brakes to slow but I started to skid. Letting up off the brakes and applying a bit of gas, I came out of the skid and was able to slow to a stop before hitting the car. I watched in my rearview mirror as a Chevy Suburban hit the brakes and went sideways. I braced for impact that, fortunately, never came. That driver stopped, let me go around the car in front of me and we both continued. I wasn't planning on going anywhere else after swinging by the office but decided my slightly shaken nerves needed cocoa. Patt sent me a Starbucks card for Christmas and Starbucks is a block from the office. It's easy in and easy out. 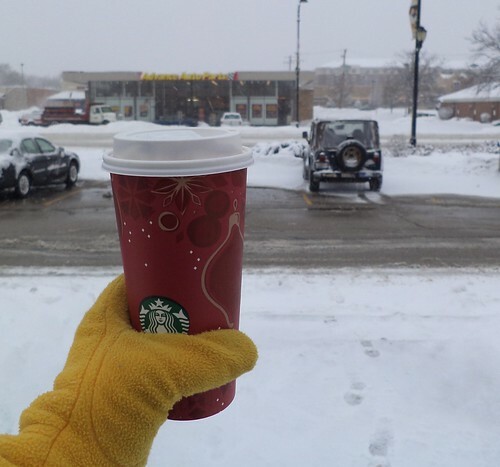 Hot beverage in hand, I headed home. Right now, I ache, all over. 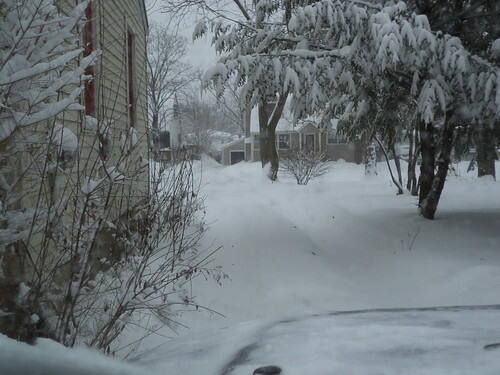 I fear this amount of shoveling, and I didn't even approach the driveway apron, has been too much, particularly this close together. Eric has been by to blow out the sidewalk. I haven't seen Kelly to inquire if he would blow out the driveway apron, although it wasn't too bad when I headed to the grocery. I could live with it if it never gets cleared until later. In spite of it being picture postcard pretty, I'm weary of it. I don't want any more shoveling snow. A couple inches is okay, but this dumping is going to make me very tired. I have friends who would love to have some snow sent their way. If I could figure out how to get it to you and it would still be snow, I'd do it. Better yet, come on up here and get it yourself. I have two shovels.